Being a quality conscious firm, we are appreciated by our global customer to manufacture, export and supply the best quality durable Goods Lifts. The offered lifter is widely used on construction sites, and other industrial processing for the lifting of goods. By making use of supreme quality basic materials, this lifter is manufactured at our advanced manufacturing unit under the stern supervision of our brilliant professionals. 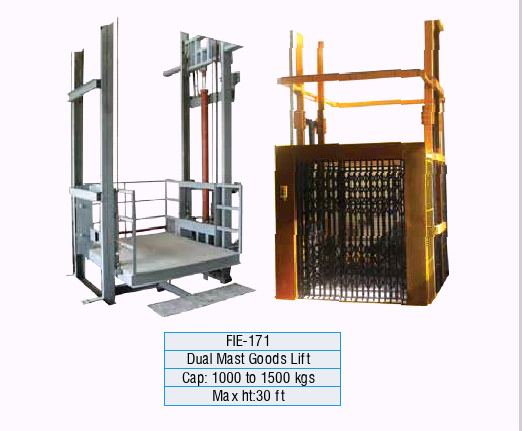 Beside this, the provided Hydraulic Goods Lifts is available for our valuable client at the most affordable prices. Our hydraulic Goods Lifts are ideal for heavy lifting jobs, and they are heavy-duty industrial lifts for buildings with goods transport and stringent service. They are suitable for use in various sectors like: hotels, restaurants, factories, libraries and large department stores etc. We design the lifts for industrial, commercial and domestic applications. They are fit for moving warehouse stock, large / bulky items, palletised goods, furniture, and much more. 4) Capacity: Upto 5 tons. 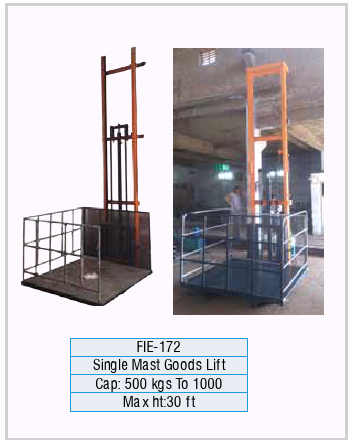 5) Lifting height: Upto 10 mtrs. The load catering capacity of our wide range of service and goods ranges from 50kg to 3000kg. The dumbwaiter service lifts offered by us are loaded at larger floor-level and waist-level loading. These Trolley lifts cater to the worldwide venues. We have various models in our stock that can be installed in a matter of days. Durable Good Lifts are our larger product and are offered with the option of with or without attendant control. These are perfect for hotels, retail, leisure and manufacturing wherein they address the demands of decreased pit and low headroom. based on client's feedback, we boast that these lifts are like workhorses that are used daily and continuously. We back the equipment with local services and maintenance support through our in-house engineers.